So, my meeting with David McDermott at JGD went really well and he now represents me on a freelance basis. The day after we met, I was sent out on an audition for Bank of America. I was given a callback and went on to book the commercial!! This is my very first real commercial and I was super excited, I still am! So, the BoA commercial that I shot was shot POV style and I had to wear a special camera helmet to capture the proper visual effect. 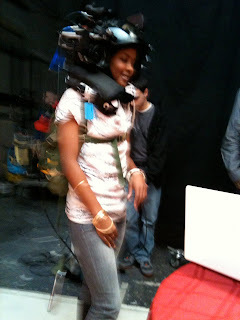 Two days before the shoot, I had to go to the studio for a rehearsal with the helmet. 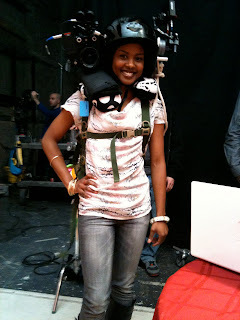 When I was on set, the crew was still putting the final touches on the camera and I knew it was going to be very heavy. Luckily, I had brought my big beanie hat with me and wearing that under the helmet gave me a great deal of cushion. The director had me walk around the set a bit and gave me specific directions. 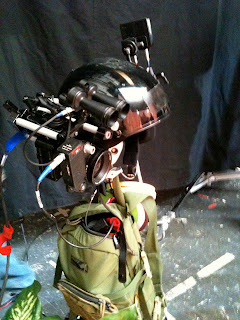 The camera on the helmet was connected to several monitors that allowed the producers and crew to see exactly what was being captured. The day of the shoot, I arrived at about 10:30am and went straight to craft services! There was SO.MUCH.FOOD. I sat in the holding room and met some of the other actors that would be in a few of the scenes with me. I didn't realize until the day of shooting that I was the "star" of my spot. There were four spots being shot over the course of two days and I was the last one. The others involved a mom and her two children, a young business man traveling for work, and a hip artist living with his two dogs. 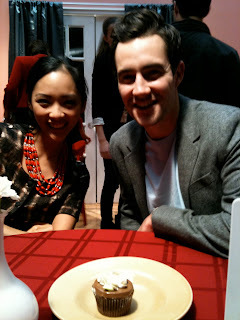 My character was Kaye, a young college grad hanging with friends and celebrating her birthday. Because the equipment that I had to wear was so heavy and restrictive, I was really doted on. The director, AD and DP (assistant director and director of photography) constantly asked how I was, brought me water and tea when I wanted, and gave me pillows to make me comfortable. Here's a video of me, Chef the AD (who liked to call himself chocolate thunder), and in the background wearing the striped shirt is Pat, the DP. Once we began shooting around 1pm, it went pretty quickly, only taking about 5-6 hours. My first scene was in full makeup and dress, the only scene where you will actually see my face. Then we shot the other three POV scenes: hanging with my friends at a burger joint, at home in my apartment alone, and at dinner celebrating my birthday. The equipment was pretty heavy and the shooting style was very technical and somewhat difficult. The were certain shots where I had to look down or move sideways, but because the camera was so heavy, Pat had to stand behind me and literally guide my head wherever I needed to point the camera. It was very meticulous. My "friends" in the commercial. This shot is exactly the way it will look on film from my POV. Pretty cool huh? I was in this thing for hours! Ok, a few breaks in between. 2. My manager set me up with Michele Bianculli, the head of the new commercial department at Stewart Talent. I met with her yesterday and the meeting went very well. She told me she would get the rest of my info from my manager and we would move from there. 3. On Thursday, my manager got me a meeting with a commercial agent at Innovative Artists and I'm crazy excited about that. Most actors/models know that Innovative is one of the THE biggest agencies out there, both East and West coast, so this is a great opportunity. I hope I'm able to impress them. 4. I have an audition tomorrow for a Macy's SAG industrial. 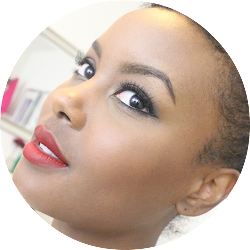 Will your face be seen in the commercial? Yes, my face will be seen in the very beginning of the commercial. Christine: I'm not sure why you can't see the video. Are you trying to watch it on youtube? There's no reason for that, it plays fine on the blog, just click the play button.